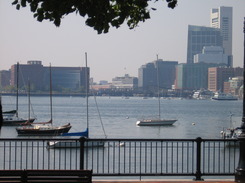 September 25th was the Boston Harbor Islands Regatta. 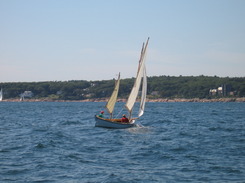 It is a "pursuit" type race around a number of the Harbor Islands. Almost 100 boats participated. 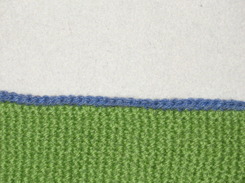 There were two divisions, spinnaker and non spinnaker. 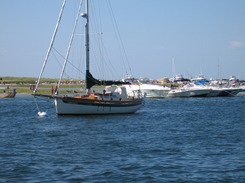 AVERISERA, led by skipper Elizabeth Lamb, sailed in the spinnaker division to finish fourth in class and 13th overall. Our fleet finish is ironic as we were bow number " 13" as well. 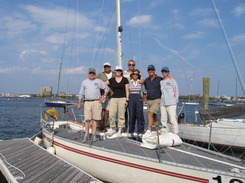 Crew of Tom Brown, Francois Asselin, Tara Knowles, Vasily and Nelli Gusev and Norman and Elizabeth pictured at the Boston Sailing Center's pontoons. The day started with the promise of lots of wind. 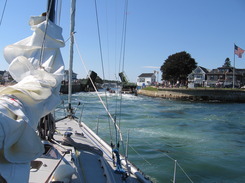 There was enough, about 10 to 15 knots with gusts to 20. The sky was blue and filled with puffy clouds. Fair weather and flat water. Perfect sailing. 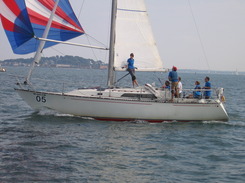 Constitution Yacht Club fared well as the best represented club and as the club with the best finishes. Richard Tubman on CHARISMA finished first in Class E, non spinnaker. He was 16th in that fleet. Special mention has to go to two boats, CLUB CAR, an S2 7.9 that finished second overall, and RUFFIAN, a J30 that finished fourth overall. Credit goes to two boats that finished way up in the pack, Typically, in PHRF Pursuit Races the last starters are the first finishers... or thereabouts. The top dozen boats have ratings from -9 to 108. 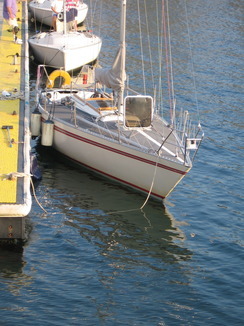 The S2 rates 168, same as a J24. A J30 rates 150 and our Aphrodite 101 at 13th, is a 135 rater. 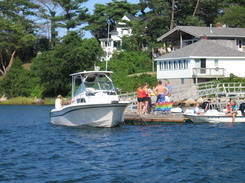 Pretty slow boats to be mixing it up with a collection of boats with ratings mostly under 100! Pictures from the finish area. Plans for pictures during the race fell apart quickly. 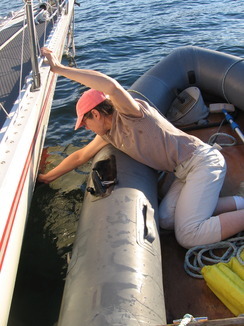 Elizabeth was busy being skipper and kept the crew focused. 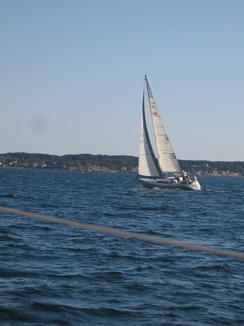 MOJITO, a C&C 35-3 from CYC owned by Tim Goodyear crossed just astern of us. After dueling all year in the Wednesday night series, it was remarkable to be able to hold them off. It is due, I believe, to the Henderson 30 kite blanketing the C&C. We were able to stay just out of the Henderson's wind shadow. Regrets to Tim and crew. 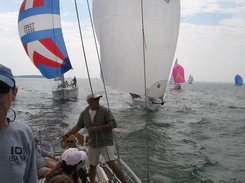 PHRF Pursuit Race tactics are still a new topic of discussion. 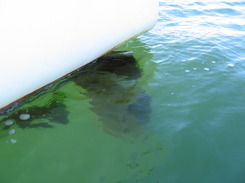 It is hard to attack a slower boat which is ahead and defend against a faster boat sailing up from astern. Clear air rules. One must look way, way down the track to find the clear air lanes and way way back to keep clear air lanes. Big rigs have a lot of advantages. More discussion on this later! First try, with shells. This is *1sc, 3dc, 1sc all in same sc, skip 2sc. * repeat around. 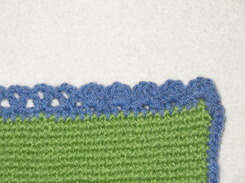 These are crochet V's. *1 dc, 2 ch, 1dc all in one sc. Skip 2 sc. * Repeat around. These are pointier shells. *1sc. 1hdc, 1dc, 1hdc,1sc all in one sc. Skip 2 sc. * Repeat around. 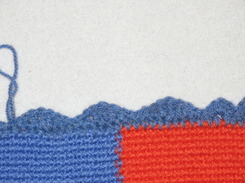 This is just a wavy border, no puffiness. 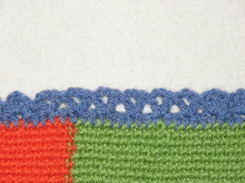 *slip stitch, sc, hdc, dc, trc, dc, hdc, sc. * Repeat around. 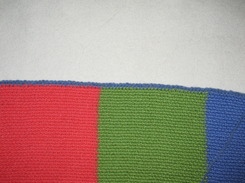 Single Crochet base along the striped side. 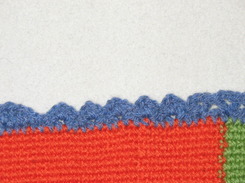 Bow Number 13 is ready to go, now. 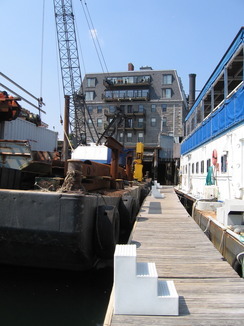 The folk at Piers Park are terrific about letting us lie alongside to work on the boat. Earl was pitched as a big deal, not unlike Danny was last year. 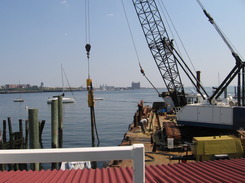 Lots of preparations to the waterfront got done and undone in short order. The storm veered off to the East, skipping Boston. In Medford, that night, heavy rain fell... straight down. 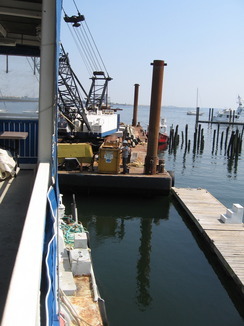 Pictured are Some "before" scenes. "After" was just the same. The view from Piers Park is the typical calm before the storm. 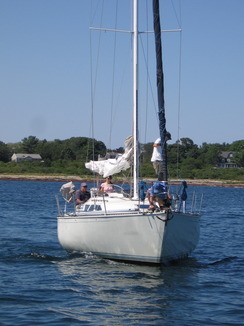 Images from a recent two-boat Boston Sailing Center Cruising Course. 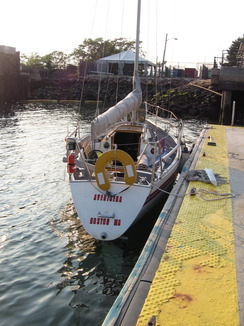 Norm skippered the C&C 40 Invictus. 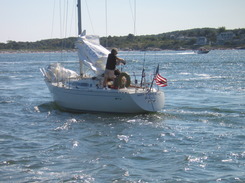 Wade Edwards skippered the C&C 38, Melissa. The trip was the usual one from Boston to Great Misery Friday night. 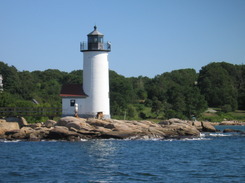 Saturday we sail up to Rockport via the Annisquam River. 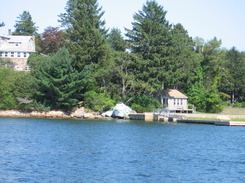 Sunday is home from Rockport via an interesting route designed to give the students a final exam. Always a good trip. After doing this for almost fifteen years, I never tire of the variety or challenges the route offers. 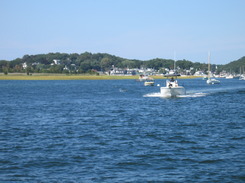 The Annisquam River, which is pictured, is one of the highlights of the trip. Not only is the River beautiful, it is a busy navigational challenge for the students.